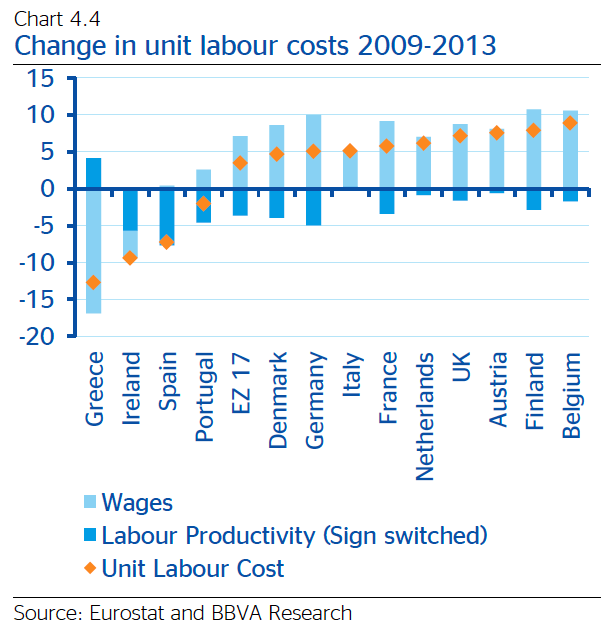 BBVA Research chart above is plotting changes in unit labour costs 2009-2013 and decomposing these gains in 'competitiveness' into productivity growth and earnings/wages cuts. Here Ireland is a shining exemplar of improved competitiveness. Alas, there are some problems with this. Wages/earnings destruction is hardly a good way for regaining competitiveness, especially when this process is associated with sticky prices (real value of income declines). In Ireland's case, we had on top of the said reductions of the purchasing power of income, also higher taxation and extraction of rents by the public sectors and by the banks. All of this 'improved competitiveness' is, therefore, a wee-bit of pyrrhic victory for Ireland. And then, of course we have our fabled increases in productivity. What happened here? Have we suddenly discovered major technological breakthrough that allow us to produce more using fewer resources? Err… not really. We took down construction and retail and domestic services sectors and reduced them to ashes. Highly labour-intensive, these sectors employed many producing lower value added than other sectors where few produce huge value added (much of it of course is superficial and accruing to the MNCs, but who cares in this land of magic competitiveness?). When we destroyed domestic sectors, we ended up with an economy producing less, but with even fewer people working. All the social welfare rolls swelling also fuelled our productivity. Of course, were we to fire everyone and just leave around one tax arbitrage P.O. Box in IFSC open, we will have miraculously higher productivity than anyone else in the world. So where are we, really, if we take out all these superficial and even potentially self-destructive 'efficiency gains'? Probably closer to Portugal - a net gain in competitiveness of around 3-4%. Not bad, but not as wonderful as our heroic 9.5% gain.